What did you think of this list? I'm surprised by No. 1. I expected the runner-up to be in the top position. I'm also surprised by Nos. 6 and 12 (too high) and No. 42 (too low). I'm also surprised by the colossal margin in figures between No. 1 and the competition. Does No. 1 really have a huge standing in markets the world over to head this list? I know you'll say you expected No. 24 to be higher up the ladder - I didn't! The detailed report tells you why Olay is at the top. It also points out why Avon and Revlon have lost the plot and why Rimmel and Benefit are growing in leaps and bounds. I'm not sure how far copyright law applies to a freely shared study report so I'm not sharing the report here but only a screenshot of a part of the list, as a teaser for you to go read the whole thing. And, if you read every word of the report (I know, I am a sucker for research projects), you'll find some gems on upcoming launches - Chanel, for one, is launching a revolutionary anti-ageing product shortly! But I'm not giving away anything - do go to the link, hit download to the right of the table and enjoy the read! 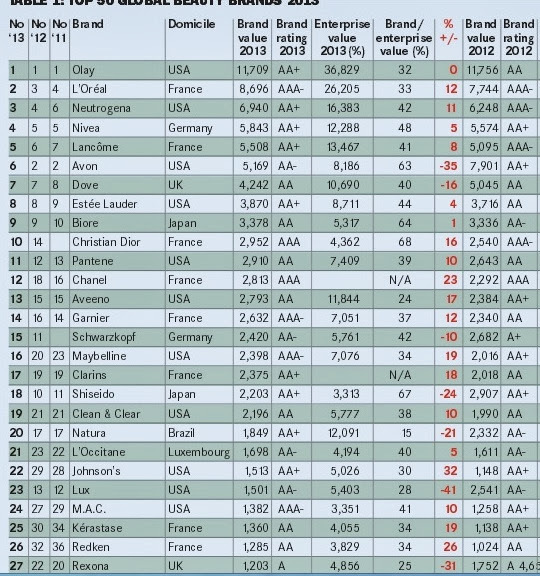 I'd like to know if you think these are the top brands. Forget figures and revenue... we are users and have the right to form opinions about top beauty brands! Does this list reflect quality and performance as well? Would you pick these names, in this order? Any surprises? Do share your take here!